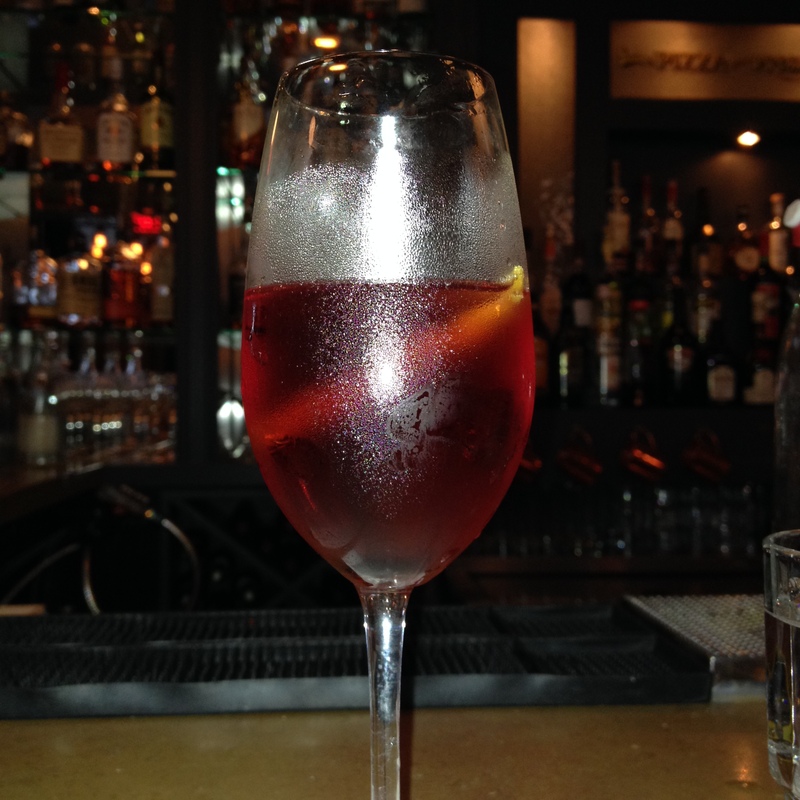 Hersh’s Pizza and Drinks – eating my way through Charm City! In case you had trouble guessing from the title. This place has pizza and drinks, and they did not disappoint. It’s a delightful little place is in South Baltimore, on the corner of Light and Wells – just far enough south of Fed Hill that you can easily find parking. The restaurant’s exposed brick, and the metal tables and chairs lend an industrial feel, but when combined with the logo of a beehived Hon eating pizza and the sign “pizza for president” above the bar makes it utterly charming. We had reservations (yay points! ), but snagged a few seats at the bar. It was happy hour – and they have great specials; cocktails, or wine, or 2 10oz mugs of beer for $5. My friends got a few of the Kir Royale (pictured) with Creme de cassis (a sweet, dark red liqueur made from black currents) and sparkling wine with a beautiful lemon twist. I had the adorable glass mugs of beer – and the 2 for $5 was entirely mix and match. There selection isn’t large (10 or so), but is thoughtfully updated to match the season. I tried a few, but my favorites were a local brew by Brewer’s Art, and a sour belgian wheat. 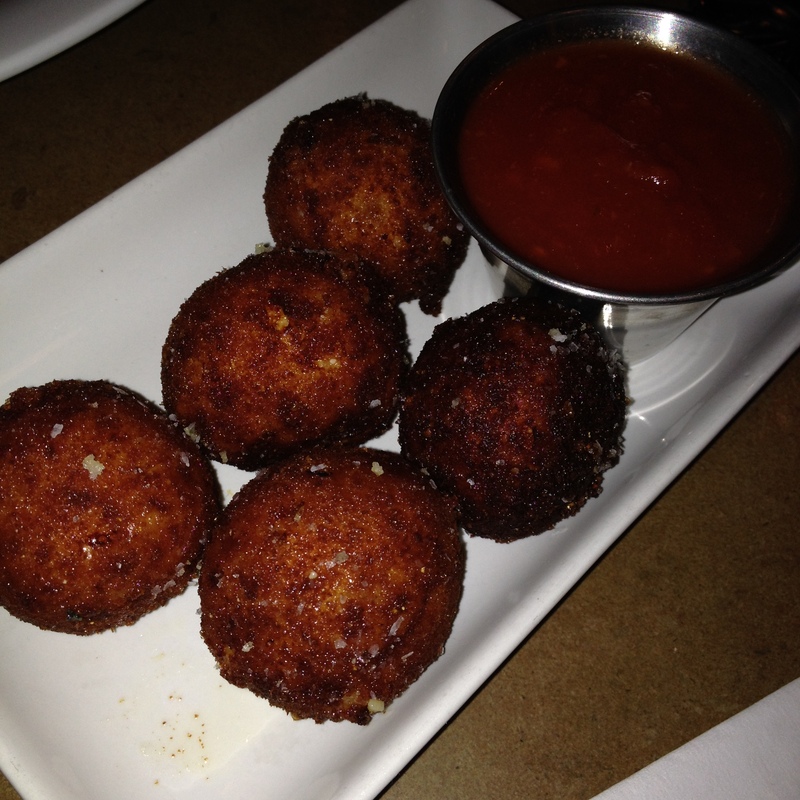 We started with the Prosciutto Balls – chopped prosciutto mixed with ricotta, house made smoked mozzarella, and piave vecchio (a nutty parm like cheese) dropped in an egg wash and deep fried – creating a ball of oozy cheesy goodness served with a sweet and tangy house-made marinara. In fact, we ordered them again for dessert—so good! Despite the German style name – this place has fantastic Italian food. How could we skip the homemade pasta section and based on recommendations? We chose the salty Pork Cheeks. 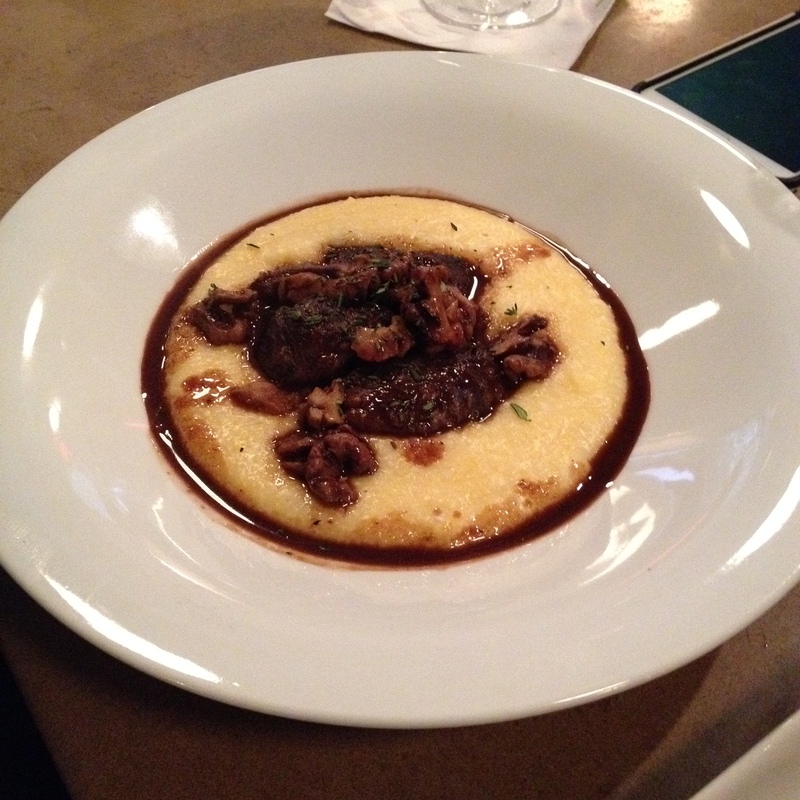 I didn’t know I liked pork cheeks, but the meat was super tender and matched expertly with the smooth, creamy polenta and sweet, crunchy walnuts. Most importantly, let’s get to the wood fired pizza. With seven house styles, who could choose just one? We got the Pork Piccante; a doughy crust covered with the piave vecchio, smoked mozzarella, braised pork, spicy fresno chilies and olives (there they are again, and I still didn’t hate them). The winner of the night was the Margherita – the yummy marinara sauce combined with the smoky fresh mozzarella, and oh yeah, the fresh basil. 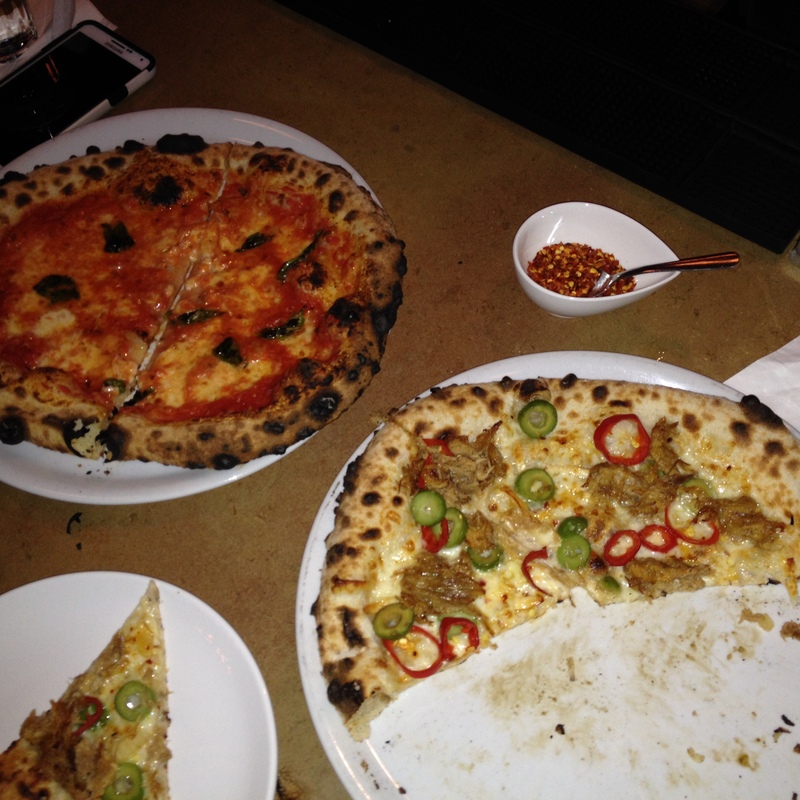 I wish I had a better picture of these delectable uncut wood fired pizzas, but they were too mouthwatering to resist. Especially with the cute little side of crushed red pepper. I am excited to go back. But next time, I will be going on a Sunday. They have a $20 fried chicken and beer deal. I can’t wait to try their unique Calabrian style double-fried chicken, sides of polenta and braised greens. Given the quality of draft beers, chances are great that you will find something you’ll love. I’m not sure what means for a chicken to be double fried or Calabrian, but I can’t wait to find out. I am not the only one who likes it here. This entry was posted in Charm City, Dinner, Federal Hill, Happy Hour, Yay! I'm a Fan!. Bookmark the permalink.